Israel used the “disappearance” of a soldier in Gaza as a pretext to kill 225 Palestinians over a three-day period last summer, a new study suggests. On 1 August last year, the Israeli military reported that one of its lieutenants, Hadar Goldin, had gone missing in the Rafah area, close to Gaza’s border with Egypt. Israel’s response was one of “shooting at anything and anybody,” according to an analysispublished this week by the Palestinian human rights group Al-Haq. Rafah came under attack from the ground, sea and air. Most of the 225 Palestinians who died were killed on the first day. By 3 August, a total of 2,579 houses in Rafah had been destroyed completely or partially. Israel reportedly invoked the “Hannibal directive” after learning that Goldin had gone missing. That procedure allows the military to kill one of its own soldiers in order to prevent his or her capture by resistance fighters. 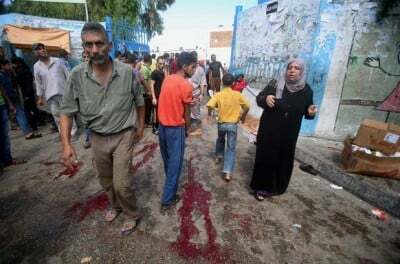 The assault on Rafah took place at a time when a temporary ceasefire was supposed to have been in place. More than 2,200 Palestinians were killed during Israel’s 51-day attack on Gaza in July and August. The Al-Haq study demonstrates that civilians bore the brunt of the attack. More than 43,500 families were affected by the destruction of homes. Around 125,000 children lived in those homes. It also suggests that Israel deliberately targeted hospitals and places of worship. A total of 61 mosques were completely destroyed and 121 partially destroyed, it says. Seven health facilities were destroyed completely and 27 partially. Seven schools were also completely destroyed and 57 suffered serious damage. And the report states that facilities for children of pre-school age were attacked, too. Of those facilities, eight were destroyed completely and 44 partially. A total of 556 Palestinian children were killed during the 51 days. Al-Haq accuses Israel of pursuing a “divide and conquer” strategy. Earlier in 2014,Hamas, which has been administering Gaza, and Fatah, which controls the Palestinian Authority in the occupied West Bank, had agreed to form a “unity government.” After making plain its hostility towards that agreement, Israel launched military operations in both the West Bank and Gaza. The timing of these offensives and their indiscriminate nature indicates they were “punitive” and “motivated by Palestinian reconciliation,” according to Al-Haq. The attacks formed part of Israel’s “over-arching policy” of separating Gaza from the West Bank with the “desired end-goal” of conquering both, the group says. Al-Haq refuses to accept Israeli assurances that it tried to spare civilians by giving them advanced notice of bombings. Perhaps the most infamous method of providing such warnings is known as a “knock on the roof.” It involves an initial bombing of a home as a precursor to a larger and deadlier attack. According to Al-Haq, all bombings of homes amounted to an attack on civilian life and infrastructure. Such “warnings” also did not absolve Israel of its responsibilities under international law. Civilians are not obliged to leave their homes once a warning is received. And “knocking on the roof” showed no mercy towards vulnerable groups such as the elderly, children or people with disabilities. In some cases, there was a very short gap between a “knock on the roof” warning and a larger attack. In one such bombing in the Khan Younis area, the gap was only five minutes. A pregnant woman and her one-year-old daughter were killed in that incident. Israel had claimed that the objective of sending ground troops into Gaza was to destroy underground tunnels used by Palestinian fighters. Al-Haq argues that it is unlikely the existence of such tunnels would have provided Israel with an “overriding imperative reason” to uproot hundreds of thousands of people. With only ten tunnels reportedly found by 20 July, the displacement of civilians was “grossly disproportionate to any direct military advantage gained,” Al-Haq adds. For that reason, it can be viewed as a form of collective punishment, something that is forbidden under international law. The new study provides solid evidence that Israel committed crimes against humanity last summer. Hopefully, it will boost efforts to bring Israel before the International Criminal Court.